The enclosure plays an important role in providing safety for your trampoline users as the safety net allows to hold back any jumps outside of the jumping mat. Moreso, children often lean against the netting as they trust in its unfailing support. Replacing damaged nets is a necessity for any leisure professional in charge of trampolines used by the general public. 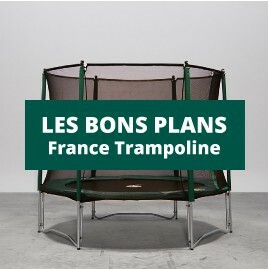 France Trampoline, professional trampoline provider since 1971, can answer all your requests for made to measure nets. Our polyester nets are made to withstand the test of time and intensive outdoor use. Your trampoline will offer the requested high safety standard. Manufacturing of made to measure nets for all trampoline sizes. Custom netsThere are 2 products.